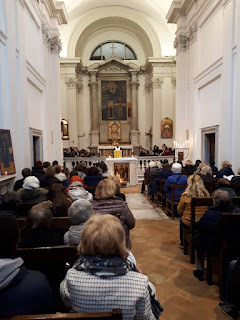 The interior of the church of Sant'Egidio, Trastevere, Rome. Here the Community, that takes its name from this place of worship, and that yesterday has completed 50 years of life, has been praying daily since 1973. In the picture the prayer for peace in Ukraine with the migrants coming from that country, last week.